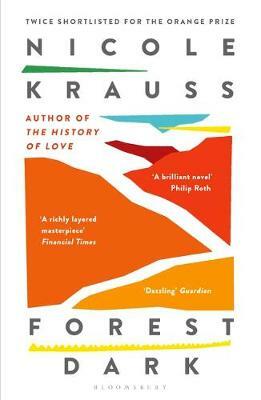 Nicole Krauss is the author of the international bestsellers, Great House, which was a finalist for the National Book Award and the Orange Prize, and The History of Love, which won the Saroyan Prize for International Literature and France's Prix du Meilleur Livre Etranger, and was shortlisted for the Orange, Medicis and Femina prizes. Her first novel, Man Walks Into a Room, was a finalist for the Los Angeles Times Book of the Year. In 2007, she was selected as one of Granta's Best Young American Novelists, and in 2010 she was chosen by the New Yorker for their 'Twenty Under Forty' list. Her fiction has been published in the New Yorker, Harper's, Esquire and Best American Short Stories, and her books have been translated into more than thirty-five languages. Her new novel, Forest Dark, a tale of transformation and self-discovery, interweaves two stories: that of Epstein, a vigorous sixty-eight-year-old who abandons the wealth he spent a lifetime accumulating, leaves New York and vanishes into the Israeli desert; and that of a younger woman, a novelist called Nicole, whose own metaphysical journey takes her out of her domestic life in Brooklyn and into the same ancient landscape. Below, exclusively for Foyles, Frances Gertler talks to Nicole about the most urgent question literature is asking itself, her strange affinity for Kafka and why she is a fan of ambivalence. There are many both clear and subtle correspondences between one of your protagonists - also called Nicole - and yourself. How far did you want the reader to receive the novel as on some level autobiographical? I really don’t have prescriptions for how the reader should receive my work. Novels don’t assert anything, they search and pose questions, and in Forest Dark some of those questions are concerned with our ideas about what 'reality' is. From where do we derive our certainty about what is 'real' and what is not? To take a simple example, physics tells us that what we perceive to be solid is not; our sense of it being so exists because it is serves us better to see a rock as solid and inert, and our senses have evolved in service of our survival. And what about the self? What is 'real' and what isn’t, and do such questions even apply, really, to something that is entirely a construction, from beginning to end? Obviously, I am not the only one to be concerned with this: it seems to be the most urgent question literature is asking itself in an era when the self is so often equated with a personal work of art, projected round the clock from multiple platforms on the Internet. There are several possible starting points for your book - Kafka and the Tel Aviv Hilton, for example – but what was the starting point for you? Certainly the Tel Aviv Hilton was one. I began to write the first chapter in what became Nicole’s voice simply to chronicle an obsession: if I couldn’t write a novel about the Tel Aviv Hilton, but was still going to be stuck at my desk every day thinking about it, then I might as well try to make something out of the experience. In a sense you could say that I wrote my way out of that little jail I’d built for myself. But Epstein was no less a starting point. He came a little bit before the Hilton brought everything to a grinding halt. It was in the year after I published Great House, and I was writing many different things, in different directions, in search of a new novel. He arrived whole, fully-formed, in a few phrases — the one about death being too small for him, for one. I think the question quivering behind his character arrived near the end of Great House, in the bit where Nadia asks, 'What if I was wrong my whole life?' Epstein — married to the material, authority and certainty incarnate — what if he had been mistaken? The slow, dawning arrival of uncertainty in the stronghold of the certain, in this case having to do with a neglect of the spiritual, was there at the birth of Epstein. It just took a very long time for me to figure out what to do with him. Did you come to Kafka primarily through his own writings or through the still ongoing legal battle for custody of his papers between the National Library of Israel and Max Brod’s descendant Ester Hoffe? I’ve been reading Kafka since I was a teenager, and even before I read him, when I was very young, I had the sense of him being somehow family. That strange affinity that goes beyond reason has only deepened with reading and the passing of years. I simply love him, the way one loves an uncle who opened a path for being in the family that otherwise would not have been possible. Epstein is a larger than life character in every way — 'he was lit brightly from within… His spirits swelled and sank and swelled again, his temper flared, he was unforgiving, but he was never less than completely absorbing.' But he is also deeply flawed. Are you drawn to this type of personality? Oh, well, we are all deeply flawed, there’s no getting around that. In life it can make us ‘impossible,’ but in fiction it’s usually the very thing that makes a character possible — one of those strange reversals. The flaws, I find, equally in life and in art, are usually the indication of rich material, the way a mound in an archaeological site is an indication that something or other is buried below. In other words, a good place to start digging. Nicole says ‘we have made ourselves ill with knowledge’ and advocates a return to the unknowable, to awe and wonder. Both Epstein and Nicole become unshackled from what they know but it is a painful as well as profound process that left me wondering how achievable you think such a return actually is. I think we all live on a kind of spectrum of being open or closed to wonder, and we are always moving on this spectrum. As children we are very open to it, and slowly convention teaches us to think otherwise. But it’s never lost to us — not to any of us, I don’t think. Those drawn to art know that a poem, painting, dance or song can suddenly split one open, and become a shortcut back to a state of feeling close to the unknown, and to the sources of life. Like everyone, there have been periods of my life when I have been more or less susceptible to that sensation. Sometimes I forget how to get back to it for a while. But like Epstein and Nicole, I would rather be forced to relinquish my certainties, however painful that may be, than close myself to what can change me. The act of creation, whether of a child or a work of art, for example, are often seen as antidotes to the soul-destroying nature of capitalism and worldly preoccupations, and yet there is a healthy dose of cynicism and doubt in the book about even these endeavours and their inward-looking nature. Do you feel this ambivalence towards your own writing, your own role as a mother? Yes. But I am, as it were, a fan of ambivalence, and feel it gets a bad rap. We live in a time that favours certainty. And yet we have conflicting feelings about most things — it is simply not possible, for example, to be a mother and not have conflicted feelings — and the instinct, because we seek comfort, is to jump to one or the other side of certainty. But to maintain the conflict, and explore it, seems to me both more authentic and more rewarding. Forest and desert have both a literal and metaphorical power in the novel. How much time did you spend in the various settings in order to be able to capture both their atmosphere and their meaning? I’ve spent a lot of time in both settings, throughout my life, but very little especially for this novel. The exception was three days I spent in the Judaean and the Negev deserts in Israel (they are continuous, so going from north to south you can drive through both). I was there, ostensibly, to figure out what had happened to Epstein. I got nowhere with that, but I was, as always, moved by the place, and happy to be there. You can’t spend time in a desert and not go a little deliciously out of your mind. One night, by the kerosene heater, I opened my computer. And then it suddenly hit me that, of course, Kafka had come here. Here to the desert, to what was then Palestine. All of the evidence turned up afterwards, in the months of scouring his letters and diaries. By which I mean, the evidence that Palestine was his only hope and means of escape and transformation, and that maybe, just maybe, he took it. The estate agent beautifully captures Americans’ (indeed probably all the diaspora’s) ambivalence towards Israel, the romanticised ideal quickly giving way to disillusionment. And yet it is the place where both Nicole and Epstein experience a kind of epiphany. Can you say something about this? There is that ambivalence again. I go right to it the way a pig goes to a truffle. Is there not something in that? That readers rely on writers, with their sharp sense of smell, to go right to the conflict, the contradiction in the heart. About Israel, yes. In addressing the longing most of us have to live other lives, Forest Dark describes the uncanny sensation of being in two places at once, both here and there. Israel has always been the 'there' to the majority of Jews’ 'here': it represents the other life we could have lived. For this reason — and because it’s a country touched in every way by the surreal — it made sense to send my searching characters there. Nicole talks about the ‘deforming’ need to make parents proud and in the case of Jews, to make their people proud. How heavily did or do these pressures weigh on you? How much courage does it take to eschew these expectations? Those pressures were there when I was younger. Children have no choice but to care what their parents think of their choices, as their parents still have authority over their lives. But even at 11 or 12, when I knew that I wanted to try to be an artist of some kind, and was met by my parents’ scepticism (How would I make a living? etc. ), it never had even the slightest influence on my conviction that I would do it, and it would be the right thing for me. Hard to say if that was my naiveté or a spark of self-knowledge, but either way it was an early resistance to other people’s ideas of what I should be, and I can think of many other examples. I think that for a while I solved the conflict of wanting to make them proud and wanting to be myself by choosing that small overlap in the Venn diagram of our desires: I excelled at school, kept to myself more or less and didn’t cause them any trouble. But all the while, beneath the placid surface, something was taking shape in defiance of many things I saw and experienced around me. That seed of opposition or resistance is, I’m sure, at the heart of most people’s impulse to make art. The desire to please very quickly gets overshadowed and knocked aside by that stronger force. It may never entirely go away, but in my experience it never wins. Absence and the void are powerful motifs in the novel — from the void before Creation, to the ‘unformed and nameless life unlived’ to the dance that constantly disappears. How do we become less fearful of the void, how do we choose one life and forgo the others? Form and formlessness are things we cycle through, just like belief and doubt/questioning in all manner of things (relationships, work, oneself) are stages we naturally cycle through. I think that the goal is to be in possession of the inner strength required to sustain formlessness for as long as it takes to evolve. And to have at bottom a strong attraction to the expansiveness of change, rather than to the stability of permanence. To commit to a form for a while is obviously productive and clarifying and necessary. The trouble begins when the form becomes fixed and takes on an inflexibility that is limiting, when it becomes an end rather than a part of a process, forcing one to work in service of maintaining it at the cost of exploration and growth. I don’t believe that one ever chooses one life and forgoes all the others. One chooses every day, and builds on those choices, and very often changes one’s mind.